"If a man really wants to protect what's his, he has to do it for himself." MGM has launched the second official trailer for Eli Roth's new remake of the 1974 action movie Death Wish, which originally starred Charles Bronson. We posted the first trailer back in August of last year, since it was originally scheduled to open in November, but was pushed back until release this March. This newest version of Death Wish stars Bruce Willis as a doctor at a hospital who decides to become a silent vigilante when his family is assaulted. Of course, the city begins to question whether he is a is a guardian angel or a grim reaper. Sounds like every other version of this vigilante story since the 1974 original. Also starring Vincent D'Onofrio, Elisabeth Shue, Camila Morrone, Jack Kesy, Dean Norris, Beau Knapp, Kirby Bliss Blanton, and Mike Epps. Does this look any better than the first trailer? Still doesn't seem like this has anything new to offer. You can still watch the first official trailer for Death Wish here, to see even more footage from this. Metro-Goldwyn-Mayer presents director Eli Roth's reimagining of the classic 1974 revenge thriller. Dr. Paul Kersey (Bruce Willis) is a surgeon who only sees the aftermath of Chicago violence when it is rushed into his ER -- until his wife (Elisabeth Shue) and college-age daughter (Camila Morrone) are viciously attacked in their suburban home. With the police overloaded with crimes, Paul, burning for revenge, hunts his family's assailants to deliver justice. As the anonymous slayings grabs the media's attention, the city wonders if this deadly vigilante is a guardian angel or a grim reaper. Fury and fate collide in the intense, action-thriller Death Wish. 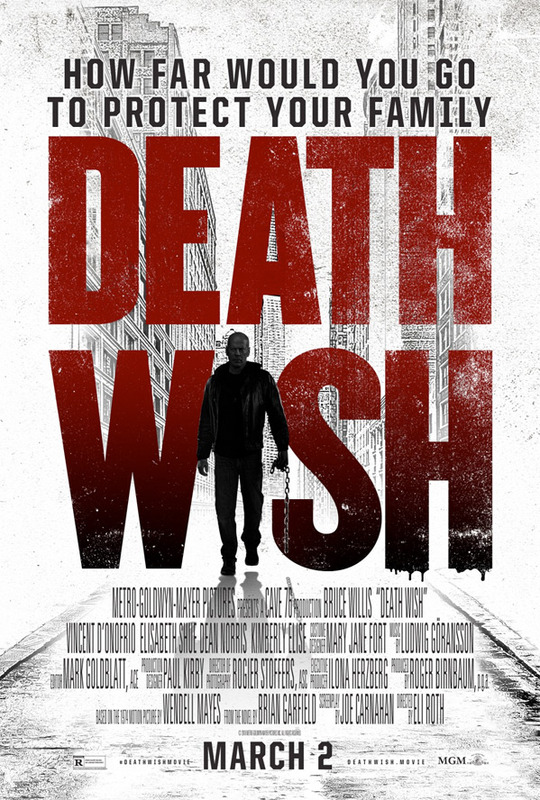 Death Wish is directed by filmmaker Eli Roth, of the films Cabin Fever, Hostel I & II, The Green Inferno, and Knock Knock previously. The screenplay is written by Joe Carnahan and Eli Roth, adapted from Brian Garfield's novel. This was originally scheduled to open in November of last year. MGM will now release Death Wish in theaters everywhere on March 2nd, 2018 this winter. Who's down?